This piece was written for a four-week class taught by Steven Heller; the prompt was to pick an everyday object that speaks to a larger human condition. The only restriction was to refrain from using Google. It might seem natural to find pre-squeezed lemon juice sold inside a dimpled, detailed, rotationally-molded polyethylene facsimile of a lemon. Perusing in the produce section, you might not even bat an eye at it. It's lemon-shaped, lemon-colored, and placed among the citruses. 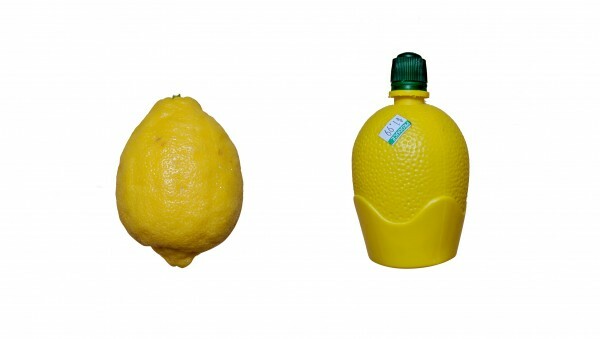 The presence of the bottle is not surprising, because it makes sense — it somehow makes complete sense to sell lemon juice in a bottle that looks like a lemon. Perhaps this sensible-ness comes from a deep-seated human need to understand where the food we are eating came from — or at least, that the food we are eating comes from somewhere at all. This seems like an anomaly in a world so decontextualized as to manifest a product like Soylent, a nondescript food product sold as a drink or a powder, and engineered to act as a faster, more efficient alternative to traditional meals. The lemon makes a point to link back to a natural world where juice is not pre-juiced, while still providing the convenience of pre-juiced juice. While the lemon might exist in the lonely category of “plastic fruit containing the juice of the fruit it mimics”, the lemon finds friends under a different taxonomy: food products that visually hearken back to their supposed origin, matching the food product with its source; the chicken with the egg, so to speak. Some of the less quirky examples of this peculiar matching act are: cereal boxes and bread bags with ears of wheat depicted on them; milk cartons that feature images of cows; and egg cartons that show chickens roaming happily. When a food is an ingredient (egg), we might have a vested interest in a narrative linking it to a provenance that we can recognize (chicken), to reinforce the naturalness of it (a chicken lays an egg). Highly processed foods, by contrast, seem to be the least inclined to reveal the processes behind them. And although it’s in vogue for some “all-natural” processed foods to make a point of highlighting the ingredients that make up a product, it’s not yet been normalized to describe the labor involved; the labor is treated as incidental when itis always essential. One example of an explicit absence of labor is on beef products or chicken meat. On these, chickens and cows are much less likely to be seen, in what is maybe an intentional distancing manoeuvre that removes the consumer — the literal consumer — from the necessary act of killing that makes the prepackaged meat possible. The labor is selectively represented: “grass-fed”, and nothing about slaughter. But maybe it’s not the act of killing that’s perturbing to us. Maybe it’s the idea of any act at all. In a world where the human labor that makes the world run is for the most part obscured or sidelined, the everyday grocery shopper might not think to look for signs of the human involvement that puts product in the aisles. But at the end of the day, a lemon cannot just become juice — not without something, or someone, acting upon it. For every single beef chuck, head of lettuce, Fruit Roll-Up melting in a mouth, there is a whole matrix of human actors whose work has contributed to the existence of the food — if only by pushing a button or operating a lever. So is there any analog to the plastic lemon bottle, that instead signifies the labor involved in bottling the juice? In a word, rarely. The invisible threads that bind us to the people and processes that make our world possible are subsumed by the promise that the pre-squeezed lemon juice is indeed coming from a lemon, or, that the chickens are free to roam the field, or that the beef has been fed grass and not God knows what else. All talk of process then centers the food product, and not the people who produced it. The hands that cultivated the lemon trees, operated the roto-molders, oversaw the whole orchestra of machinery, are left only to our imagination.